If you go to Tainai, The Flower Night Market is a tourists attraction night market that you shouldn’t miss. According to Wikipedia, this night market is 1 of 3 largest and famous night market in Taiwan. It is said "South is Flower, Middle is Fengjia, North is Shihlin". Although it is a periodic night market, but it has nearly 400 stalls that are divided into 4 main areas, namely food, fashion, grocery and entertainment. We came all the way here for only 1 thing, FOOD. 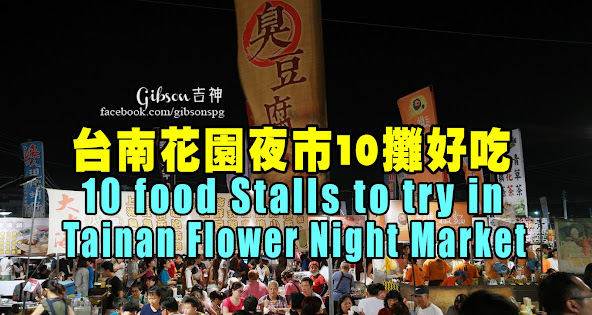 The Flower Night Market is open on Thursdays, Saturdays and Sundays, from 5pm – 12am. However, please be prepared to “squeezed in” with the huge crowd. This night market has 4 entrances, we were at entrance 2 which is located at the food section. At the entrance, we were attracted by the aroma of fried fish that led us to this stall. The stick was fried on the spot after placing your order. You have few sauces to add, but Gibson recommends the Chili sauce. Deep fried Fermented Bean Curd Boneless Chicken, which tastes better than our regular fried chicken, a bit addictive too. Gibson Forgot to ask for the price of the chicken. It has a rather tough texture, if you haven’t tried before, no harm to be adventurous. However, their other snacks are worth trying, especially if you haven’t tried the local famous snack, the Duck Blood Jelly. The Duck blood jelly has a similar texture to our pork version. However, Gibson was only interested with the Fish ball. The soup is salty & spicy, very appetizing. This BBQ Mochi can be enjoyed either salty or sweet flavours. After trying both flavours Gibson prefers the sweet version. If you go in a group, consider trying all the available flavours as you can see in the picture. One of the 8 “Queueing” food stalls in the night market that Gibson highly recommends. You get to choose 4 types of stuffing, namely minced pork, prawn, calamari and codfish. The dumpling skin is thin, a bit like our Chai Kuey, but this dumpling is added with stock and chili sauce, which has the balance taste of sweetness and saltiness. The stinky stick is actually fries that are made of stinky Tofu. They offer 12 flavours, but Gibson saw many choosing the Salt flavour, so he decided to do the same. It turned out to be a good choice that also goes well with alcohol drinks. Although they named the stall duck wing, but they also sell all sorts of braised snacks, and all are serve cold. We came here for the duck’s tongue, but we also tried other snacks. However, Gibson still prefer the hot version. A big plate of grilled oyster only costs for NT$150. The oysters were juicy and tender. We ordered another plate as we really enjoyed the food. A huge scallop that only cost for NT$50, a heavenly treat. 2 flavours are offered, which are the garlic and black pepper. Gibson and friends can only take in 1 box at this point, thanks to the seller, who agreed to include both flavours in a box. But the prawns served cold, is the downside of the dish.